The original guide to Scotland’s mountain environment aimed at hillwalkers and climbers has just been updated with a new edition. 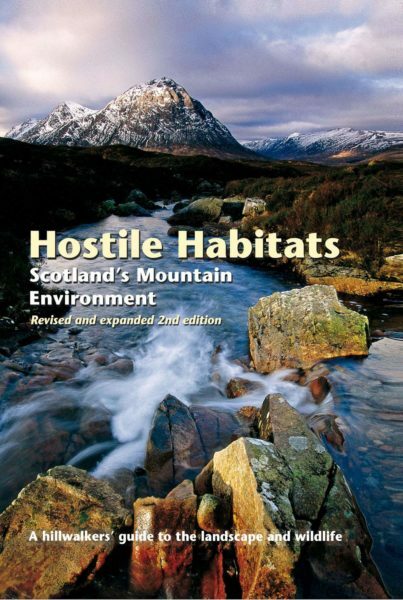 When Hostile Habitats was first published in 2006 it brought together information on the full context of Scotland’s hills – geology, landscape, flora and fauna, and human history – into one accessibly-written guidebook aimed at hillwalkers. The book proved popular and this second edition keeps to the same arrangement of nine chapters, written by different experts, but has been expanded and updated to reflect changes in understanding. A hefty hardback, this is a book to dip in and out of rather than to be read in one go or take out on the hill. Don’t be put off by the size or text-heavy format, it really is written for the average hill-goer. Referring to it in the evening to look up a plant seen underfoot on that day’s walk invariably leads to an interesting explanation of why that plant only grows on certain rocks, which themselves are only there due to how the ice age affected that part of Scotland. The book starts with a chapter on that popular obsession: the weather, with subsequent chapters covering geology, landforms, vegetation, invertebrates, mountain birds, mammals, reptiles, amphibians and fish, the traces of past human activity, and finally the future of our mountains. Want to know your blaeberry from your crowberry? The identification sections have been much expanded in the second edition and are one of the most useful sections of the book, well illustrated by photos and full of interesting facts. Who knew the crowberry was edible but bitter tasting and that the hermaphrodite form is found pretty much only in Scotland? Whilst a standard plant ID book could tell you some of this stuff, the fact that Hostile Habitats places it within a fuller explanation of the whole mountain environment makes it much more useful and a joy to dip into. One of the most interesting chapters for me is written by John Gordon on Shaping the Landscape. This explains why all the landforms we are all familiar with on days in the hill (corries, wide straths, hummocky moraines etc) look like they do and how they were formed. Have you ever slogged up a high slope and found yourself crossing alternating mini-terraces of wind blasted heather and loose ground? This is usually the effect of the wind blasting vegetation which has gained a hold on land weathered by seasonal freezing and thawing, which over time sorts the ice-shattered rocks by size, creating stripes of smaller stones between the vegetation. Any regular hillwalker will immediately find land features, plants, or wildlife that they are familiar with featured in the book. This can make hill days more satisfying and might even cause some of us to slow down and appreciate stuff we’ve taken for granted over the years. Looking up my local hills, the Cromdales, it was reassuring to see upland waders such as curlews and lapwings mentioned as well as the Cairngorm reindeer herd; these are familiar companions on local walks. The final chapter The Future of Our Mountains is written by Nick Kempe (of Parkswatch) who co-edited the book alongside Mark Wrightham and talks about changes in the use of Scotland’s uplands. This chapter has been much enhanced with new sections on the future management of our mountains. Trends include the intensification of grouse moor management, the move towards more conservation-minded forestry, the introduction of beavers, and the growth of outdoor recreation and tourism and provide interesting food for thought for anyone heading into the Scottish outdoors. At £20 the book is very good value and profits go to support the work of the Scottish Mountaineering Trust. Hostile Habitats, £20 in hardback, is published by the Scottish Mountaineering Turst.